We interview child survivors of Nazi persecution and other persecutions, who were 0 – 14 years of age at the time persecution began in the country in which they were living. We also interview those who witnessed Nazi persecution of children, as well as children of Nazis. We have collected 1531 audio-taped interviews with child survivors of the Holocaust, most of them Jewish, but some from other backgrounds. We continue to interview people who were fourteen or less when people in their countries were first subject to the effects of Nazi invasion and/or persecution. These include children who were in camps, in hiding, sent away on transports, as well as witnesses to atrocities. Austria, Australia, Canada, Czechoslovakia, England, France, Germany, Greece, Holland, Hungary, Israel, Italy, Norway, Poland, Roumania, Russia, Spain, Sweden, Switzerland, Yugoslavian, and Others (Interviews mostly conducted by Yale University). We have transcribed about 65% of interviews and translated into English about 54% of all interviews. Almost all interviews have been categorized (coding stage one) for place of birth, age, type of persecution, and a few other variables. This is the largest archive of interviews of child survivors. It is focused on the psychological aspects of the experiences of children suffering massive trauma. It is a valuable resource for child survivors seeking to learn more about the experience of others and for those working with traumatized children today. If you are interested in participating in this project, please Contact Us. Let us know your interests and if you speak any foreign languages. 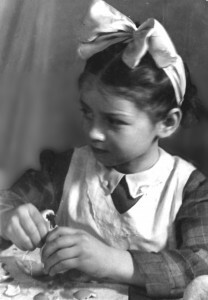 Photo Courtesy Judith Alter Kallman, as a child adopted in Budapest, 1943. From A Candle in the Heart.